Even the most cynical grownest man can occasionally enjoy something childish and girly -- though some might argue that at 17, Scotty McCreery's no longer that childish, and that there's nothing occasional about obsessively re-watching him on TiVo. 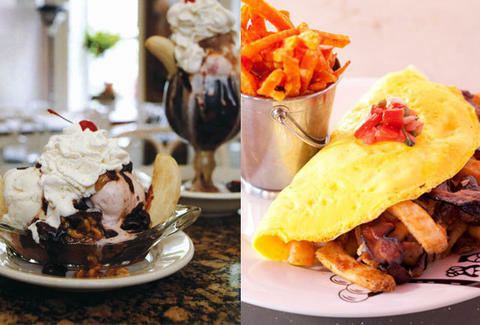 Whatever, just go squeal over ice cream sundaes, at Serendipity 3. The Georgetown iteration of a whimsical NYC parlor that you totally didn't already know was just featured on the Kardashians' show, Serendipity's charmingly stuffed with antique-looking Tiffany lamps, a 1960s photograph of Andy Warhol (with their co-founder), and a huge clock from D.C. jeweler Galt & Bros, where it's always don't-walk-by-with-your-girlfriend-o'clock. Justify your dessert by first hollering at eats like a chili and cheese footlong hot dog, new-to-DC jumbo lump crab cakes w/ Pommery mustard sauce, and a bacon/ French fry/ mushroom/ cheddar omelet called the "Monumental Hangover", which is also the working title of a sequel where Ed Helms tattoos Washington's likeness on his forehead after ripping dollar shots at McFadden's. Dinner done, get satisfyingly gross with the "DC Treasure Chest" (a four-serving chocolate chest filled with assorted ice creams, cookies, and cakes), or hit individual monstrosities like the chocolate cake/vanilla & chocolate cream/whipped cream "Forbidden Broadway", and the dark chocolate/strawberry sauce/chocolate "Jackpot", both of which they list as "Drug Store Sundaes", or what a jonesing Rush Limbaugh calls "the day of the week that never comes fast enough". To fully satisfy your sweet tooth (and destroy the rest of them), they've also got the $1000 "Golden Opulence Sundae" (which holds the Guinness World Record for the most expensive in America), plus eight flavors (from Mochaccino to Peanut Butter) of their renowned "Frrrozen Hot Chocolate", which despite the number of r's, isn't nearly as cool as Scotty.